Octopus Frontlet, A.D. 300–600. Moche; Peru, La Mina. A major international loan exhibition featuring luxury arts created in the ancient Americas will go on view at The Metropolitan Museum of Art. Showcasing more than 300 objects drawn from more than 50 museums in 12 countries, Golden Kingdoms: Luxury and Legacy in the Ancient Americas will trace the development of goldworking and other luxury arts from Peru in the south to Mexico in the north from around 1000 B.C. to the arrival of Europeans in the early 16th century. Emphasizing specific places and moments of extraordinary artistic achievement, as well as the exchange of materials and aesthetic ideas across time and place, the exhibition will present a new understanding of ancient American art and culture—one based on indigenous ideas of value—and cast new light on the brilliance of ancient American artists and their legacy. The exhibition will feature spectacular works of art from recent archaeological excavations—crowns, pectorals, pendants, necklaces, ear and nose ornaments, rings, labrets, masks, mantles, goblets, vases, stelas, bells, mirrors, painted books, and more—that have rarely, if ever, left their country of origin. Daniel H. Weiss, President and CEO of The Metropolitan Museum of Art, stated: "It is a great privilege for The Met to present this stunning assemblage of highly prized works of art from more than 50 organizations. This exhibition is the result of an intensive five-year research effort that brought together scholars from across Latin America and the United States, and we're thrilled to share their findings and these beautiful objects with our visitors." 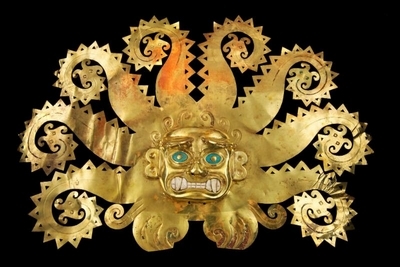 Exhibition highlights include the exquisite gold ornaments of the Lord of Sipán, the richest unlooted tomb in the ancient Americas; the malachite funerary mask of a woman known as the Red Queen, from the Maya site of Palenque; newly discovered ritual offerings from the sacred precinct of the Aztec Empire; and the "Fisherman's Treasure," a set of Mixtec gold ornaments plundered by Spanish conquistadors and destined for Charles V, the Holy Roman Emperor and Spanish king, but lost en route to Spain. Recovered from a shipwreck in the 1970s, these final works are poignant reminders of the brilliant traditions of ancient America's lost golden kingdoms. "Ideas about artistic production in the ancient Americas have traditionally been based on works in ceramic and stone—objects of durable materials," said Joanne Pillsbury, The Met's Andrall E. Pearson Curator of the Arts of the Ancient Americas. "But there were also exquisitely worked objects of rare and fragile materials—most of which were destroyed at the time of the Spanish Conquest. Countless works of gold and silver were melted down, and delicate native manuscripts were deliberately burned as part of campaigns to stamp out native religions. And time has taken a heavy toll on featherworks and textiles, which were considered more precious than gold by many indigenous societies. What we present in this show are not only spectacular artworks, but also rare and enormously important objects that escaped destruction." In the ancient Americas, gold, silver, and copper were used primarily to create regalia and ritual objects—metals were only secondarily used to create weapons and tools. First exploited in the Andes around 2000 B.C., gold was closely associated with the supernatural realm, and over the course of several thousand years the practice of making prestige objects in gold for rulers and deities gradually moved northward, into Central America and Mexico. But in many areas other materials were more highly valued. Jade, rather than gold, was most esteemed by the Olmecs and the Maya, while the Incas and the Aztecs prized feathers and tapestry. In all places, artists and their patrons selected materials that could provoke a strong response—perceptually, sensually, and conceptually—and transport the wearer and beholder beyond the realm of the mundane. Golden Kingdoms explores not only artistic practices but also the historical, cultural, social, and political conditions in which luxury arts were produced and circulated. The materials of ancient American luxury arts were closely associated with divine power: they were made of materials thought to have been emitted, inhabited, or consumed by gods. Luxury arts were also relatively small in scale, which meant they could be transported over vast distances as royal gifts or sacred offerings, thus serving as a primary vehicle for the exchange of ideas across regions and through time. The exhibition will present a new portrait of the ancient Americas—one unconstrained by today's national boundaries—revealing networks of artistic exchange in historical context. The exhibition is accompanied by a fully illustrated catalogue published by the J. Paul Getty Museum and the Getty Research Institute, Los Angeles. The exhibition was previously on view as part of Pacific Standard Time: LA/LA at the J. Paul Getty Museum, Getty Center (September 16, 2017–January 28, 2018). Golden Kingdoms: Luxury and Legacy in the Ancient Americas is co-organized by The Metropolitan Museum of Art, the J. Paul Getty Museum, and the Getty Research Institute. The exhibition is curated by The Met's Joanne Pillsbury, Andrall E. Pearson Curator of the Ancient Americas, in collaboration with Timothy Potts, Director of the J. Paul Getty Museum; and Kim Richter, Senior Research Specialist at the Getty Research Institute. The exhibition is made possible in part by DAVID YURMAN. Additional support is provided by the Sherman Fairchild Foundation, Alice Cary Brown and W.L. Lyons Brown, the Estate of Brooke Astor, the Lacovara Family Endowment Fund, William R. Rhodes, and The Daniel and Estrellita Brodsky Foundation.